Before the arrival of Ravelry, one would find a project, buy supplies and cast on. There was the occasional consult with fellow knitters and staff at the LYS but aside from that you just knit the project. 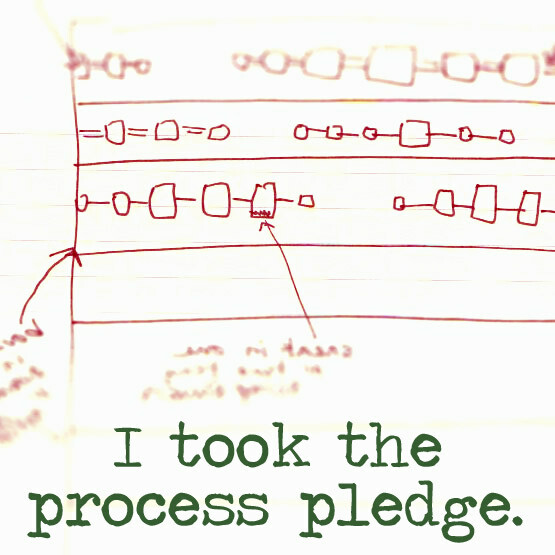 Since the inception of Ravelry many of us research, research, research. What yarn was used, needle size, and most important what modications where added to improve or alter a pattern more to our liking. I’m one of those knitters. Almost to the point of taking weeks to actually start a project because I spend so much time reading about what everyone else did. That is called, “letting your head get in the way”. Many times that can be a big problem but in the case of the Go-veralls it served me well. So here is a detailed write up of what I did, per request…it’s very chatty… I apologize in advance. My gauge was a bit off. I was getting 4.25 to 1 inch so I knit the 12-18 month size even though my girl is only 9 months. The math just worked and I wanted it a bit big. On the Leg: Follow directions up to last increase. On rnd 8 after the last increase begin the gusset as follows. Rnd 1: M1P between the first and last stitch. Mark as the center stitch. Rnd 2: Increase on either side of the center stitch in purl. Rep rnds 4 & 5 up to 9 gusset stitches or wider if necessary. Then work even to the desired leg length. Repeat for the other leg. Once the legs are the desired length, put the gusset stitches on a holder, join the legs as directed in the pattern but knit 3 rnds even then work the first decrease. 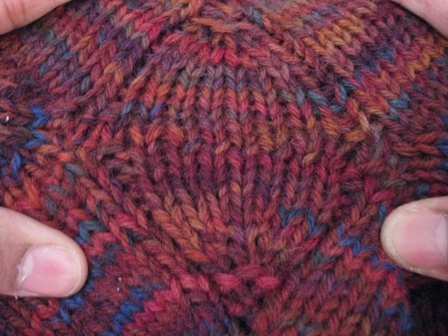 Set 1: Knit to 6 stitches before the side “seam”, wrap and turn the 6th stitch. purl back to 6 stitches before the side “seam”, wrap and turn the 6th stitch, knit back and continue the rnd. Remember to knit/purl the wraps with the respective stitch. Set3: Knit to 10 stitches before the side “seam” on each side. When I “kitchenered” the gusset I picked up an extra stitch on each end. So you’re actually working over (in my case) 11 stitches. That closes any remaining holes. I’m so sure that all could have been said with half the words. My intention is to be helpful…hope I have been. Thank you!!! I am going to try this with the next one I make. i love your modifications. thanks so much for putting them all down and sharing them with us!! i’m casting on as soon as i disassemble a thrift store sweater for yarn. can’t wait! When you say: On the Leg: Follow directions up to last increase. On rnd 8 after the last increase begin the gusset as follows. I’m having this same question as well. Seems to me the leg will be way too long this way, so I guess you meant “before the last increase”? I’m putting in a lifeline and will try it that way. 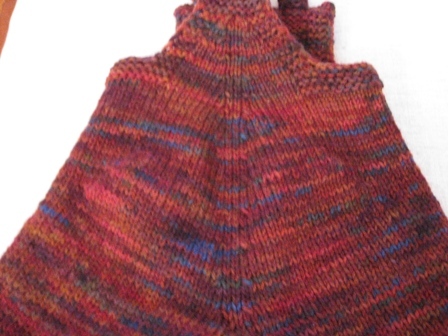 I’ve knit this and tried some variations. It seems that 8 rounds after the last increase is correct, as stated above in the blogpost. Seems to be too long, but the gusset part is basically a horizontal piece of fabric that doesn’t really add length. Hi- thanks so much for your post- it’s great to have these modifications! I have a clarification question about the short rows, I guesss I’m unclear by what you mean by side “seam”. For the 3T size, is that basically, 32 stitches (half the circumference of one leg) from the beginning of the round marker? so the first short row (6 stitches from side seam) would be at stitch 26 (32-6)? (on the “front half” of the leg). And then on the other side, It would be 26 stitches from the “back center marker” (which would be on the “back half of the other leg). Is this right? It seems uneven, but maybe I’m just unclear about where the “side seam” starts. I would really appreciate a quick clarification on this. but thank you again for your post! I’m excited about these pants! I am starting this project and can’t figure out how one is to join in a round with 52 stitches… Am I reading something wrong? mi piacerebbe avere lo schema della tutina grigia in italiano.se possibile.grazie.